This post had to be delivered eventually, as I’m obsessed with Grafton’s vulnerable, witty heroine solving murders under an 80s-style California sun. Grafton was one of the women authors (along with Paretsky) to break the literary female detective away from the likes of Christie’s Miss Marple. See, Kinsey was young, spunky, a business owner, and American; and somewhat on a different spectrum than Miss Marple and other English female sleuths. Nevertheless, that wasn't all Grafton did when she created Kinsey, and subsequently saw the release of the first book in her series [A is for Alibi] in 1982. She also grinded and molded her protagonist into a private investigator that was just as (if not more) self-sufficient and capable than her male counterparts. I can't remember what introduced me to the series specifically. It’s always been a familiarly unexplored type of relationship. Something about a casual bookstore browse, and an omnibus book containing the first three books in the series, comes to mind. Nevertheless, it wasn't until I wanted a new female voice– other than the likes of Cornwell’s Scarpetta and Gerritsen’s Isle–did I finally pick up a copy of A is for Alibi. 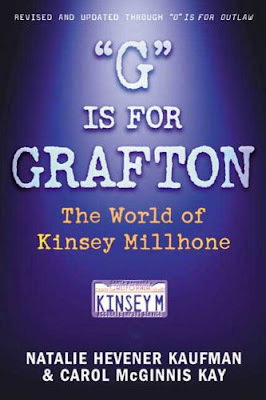 Should I lay out all the reason why I'm so in love with Grafton’s Kinsey Millhone next? Or should I keep it quick? The first and obvious factor is because she’s a woman, doing what is traditionally (while I hate to point this out) a job held by men. Secondly, I identify with her—almost on a root level. I found that the above quote kind of says most of what I want to say, or at least put it in better words. So I'll leave it at that for now, while filled with the temptation to re-read the series as I anticipate the reveal of the 24th book in the series.